Known as a Planetary or Epicyclic transmission the main components of the Model T Ford Transmission are the triple gears, transmission drums and clutch discs. The term planetary transmission comes from the similarity of action between the triple gears around the drive gear and that of the planets around the sun. The next part of the assembly is the three transmission drums, one for low speed gear, one for reverse and the drum furthest from the flywheel, the braking drum. 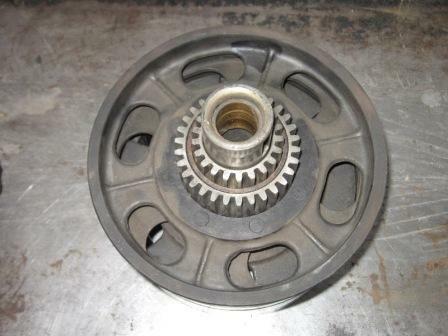 The low speed and reverse drums both are riveted to gear wheel assemblies that are in mesh with the triple gear teeth. The third drum houses the clutch disc assembly, which when clamped by the spring pressure, produces a direct drive to the flywheel. All three drums spin with the flywheel. Their spinning is controlled by the constriction of (originally) woven cotton lined steel bands, the cotton attached to the steel by brass rivets. 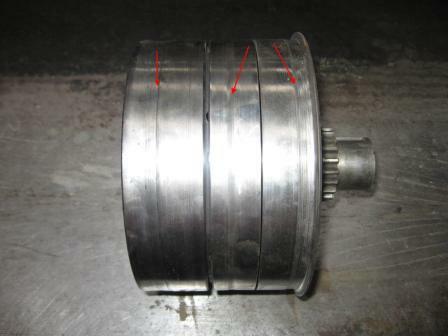 When one of the pedals is pressed, the corresponding band clamps around the drum, stopping it spinning and in turn, either stopping the drive, or altering the speed of the drive to the rear axle. Confused yet? 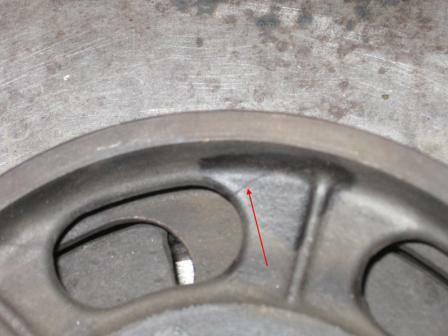 See the pictures below of the drum assemblies, note the wear in the drum surfaces, caused by the rubbing of the band lining rivets and the crack to the centre of a drum, unfortunately, a weak point in the design. Then read on for a simple explanation of just how this all works! "Which Transmission bands should I use?" is a question often posed by newer Model T drivers and those facing replacement of bands for the first time. 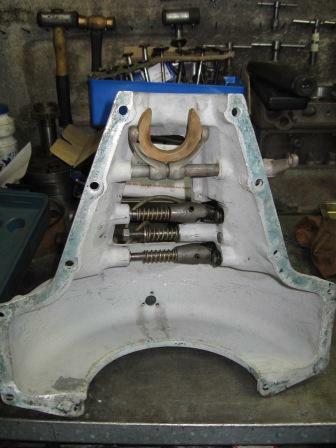 Read how to complete a commonly needed Hogshead (Transmission Cover)repair here.